Blooming 'eck! Bluebells are about to start popping up in their thousands across Surrey. Here's where to find the best of them, plus our pick of nearby pubs for a cheeky pitstop. 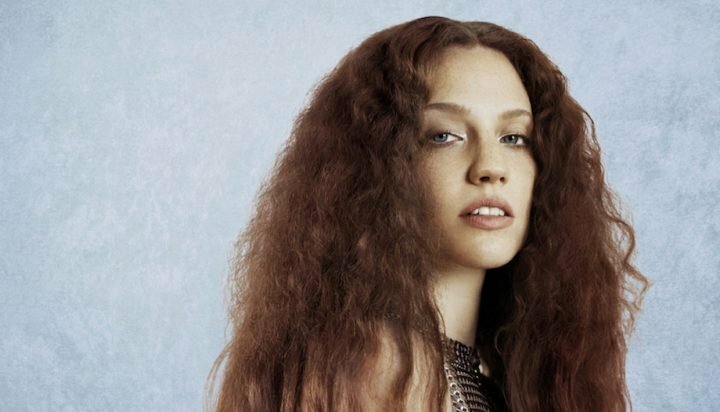 What’s a sure sign that it’s finally spring? Finally retiring your thermal vest, yes. But more excitingly it’s the arrival of bluebell season. 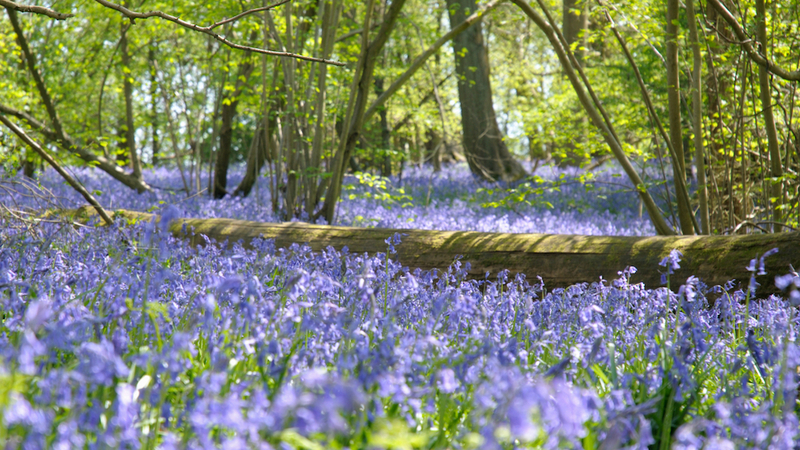 We’re so lucky to have the most incredible number of bluebell woods in Surrey – and these stunning fields of blue are about to start to bloom and last only a few weeks. So, chop chop! Every year when I write about bluebell hotspots I receive a flurry of messages about the ones I’ve forgotten. Have I finally nailed a comprehensive list this year, I wonder? Please let me know if there are any omissions! You’ll find these delicious blue blooms scattered through Preserve Copse within the estate’s gardens, but for the best displays you’ll need to walk a little further. Follow one of the four way-marked walks across the 1,400-acre estate the shadier parts of ancient woodlands. Rangers suggest the Ranmore Common walk, which is way-marked with blue markers and butterflies on the paths. Or join the Spring Bluebell Walk on Sat 13 April for a guided tour. The two-hour walk sets off at 11am and is £5 for adults and £3 for kids. Pitstop: The obvious suggestion for refreshments would be the Cowshed Coffee Shop or the Granary Café at Polesden Lacey. Denbies Wine Estate is less than two miles away offering the Gallery Restaurant as well as the Conservatory Restaurant. Or for pubs, The Running Horses in Mickleham is about 5 miles away. There’s nothing more enchanting than stumbling across a vibrant carpet of woodland bluebells. In the Banstead Woods, near Chipstead, bluebells flourish and they are at their best between mid-April and late May. Pitstop: You can walk to The Ramblers Rest from Banstead Woods, and as well as allowing dogs into the bar, there’s a great garden. The White Hart in Chipstead is a couple of miles away. The bluebells in this 200 acres of woodlands and meadows are a sight to behold in spring, filling the air with their scents. Pitstop: The African-influenced Percy Arms at Chilworth is 3 miles away, and as well as offering fabulous food, also has boutique rooms. The Seahorse in Shalford is a couple of miles away, or head into Guildford to The March Hare or The Weyside. 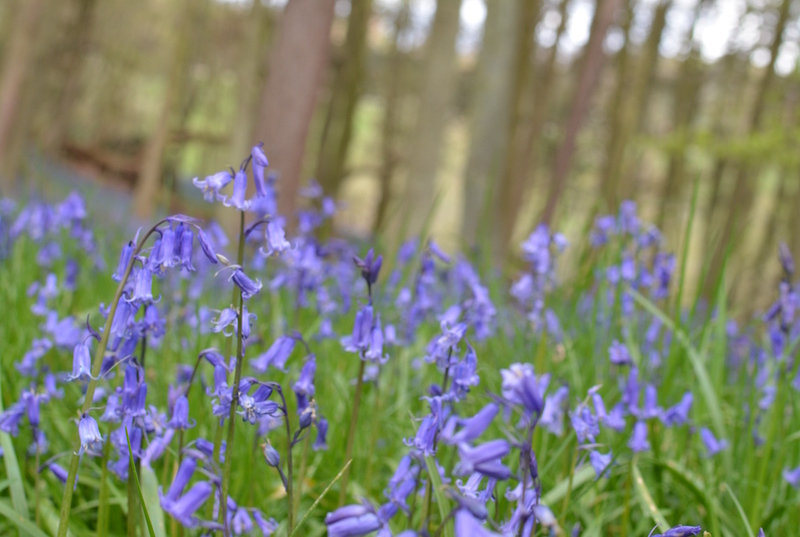 The woodland at Gatton Park become a festival of blue during spring as the native bluebells run riot. The park at Gatton Park is known for the work by English landscape designer Lancelot ‘Capability’ Brown. The woodlands are managed by the National Trust, and are open access all year round. Pitstop: The Black Horse in Reigate or the Skimmington Castle in just outside are both great for pub lunches. 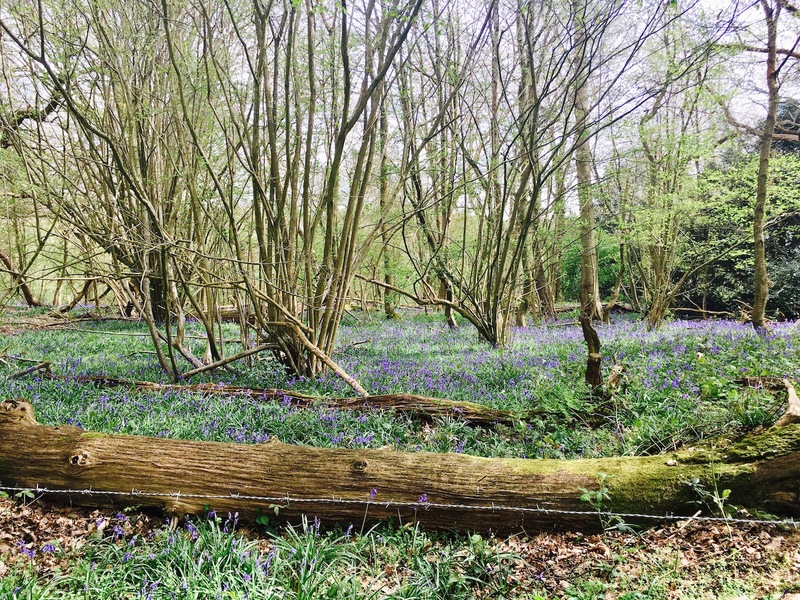 A haven for dog walkers, this woodland near Sanderstead and Warlingham is magically pretty when the English bluebells bud into flower. There are easy-to-follow paths, and it’s all fairly flat, so ideal if you’ve got a buggy in tow, or it’s a gentle walk you’re after. I took this photo last week – this week the carpet of flowers is even thicker. Pitstop: Walk from Kingswood across country to The Harrow just outside Warlingham, or venture a few miles further to Botley Hill Farmhouse. This is where King john sealed the Magna Carta 800 years ago, but at this time of year, the ancient woodland flowers take centre stage. In Cooper’s Hill Woods, spring arrives with thick patches of bluebells, lesser celandines, dog’s mercury and wood anemones creating a magical atmosphere. The National Trust’s oldest tree, a 2,500 year-old yew known as the Ankerwycke yew is also here. Pitstop: Two excellent choices in nearby Englefield Green – the French-influenced Barley Mow on the green, or The Fox and Hounds. These woodlands are well known for their displays of spring flowers, particularly the carpet of vibrant bluebells. The woodlands are on Weald Clay. You’ll find oak, ash, birch, rowan or mountain ash and hazel trees, as well as some holly, wild cherry, hawthorn and crab apple trees. 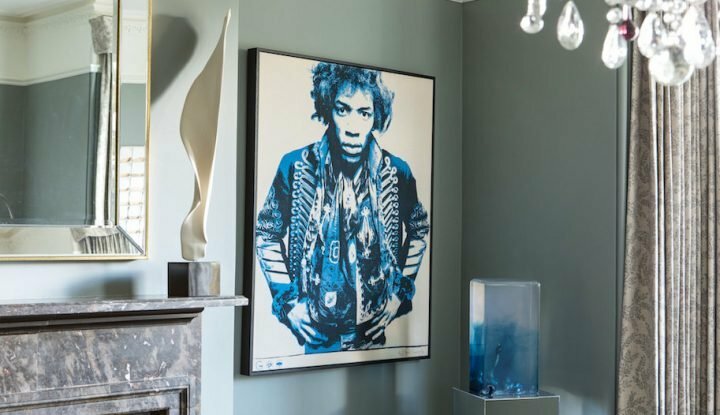 Pitstop: Former Muddy Awards winner The Richard Onslow in Cranleigh is six minutes drive way, or The Red Lion at Shamley Green is just two minutes away. 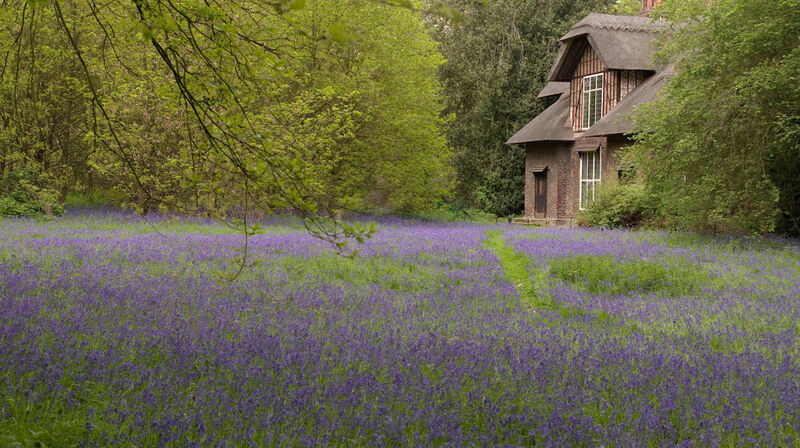 The woodlands near Queen Charlotte’s cottage is one of the best places to see the bluebell displays if you live closer to London. This 18th century thatched cottage and these ancient woods, part of which is over 300 years old, were a private haven for Queen Charlotte. Pitstop: The Kew Gardens Hotel, The Shaftesbury and The Greyhound are all good choices. A steep walk through ancient woodland to the top of the hill rewards visitors with fine views and beautiful displays of bluebells along the way. A quiet and peaceful spot, with many species of tree, including oak, sweet chestnut, hazel and rowan. You’ll also find a stone folly built in the 1930s, which is now a Grade II listed building. 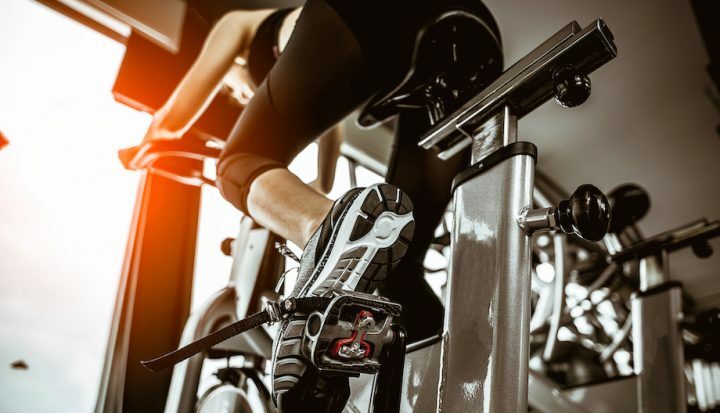 Pitstop: The Grantley Arms in Wonersh is a couple of minutes in the car, or head to The Percy Arms at Chilworth which is less than 10 mins away. The 18th century landscaped gardens at Painshill have some wonderful bluebell displays. Take in the unique 18th century follies including The Ruined Abbey, Turkish Tent, Gothic Temple and Gothic Tower while you’re there. Pitstop: The Cricketers just out of Cobham is a Muddy favourite just five minutes drive away, or head to The Plough Inn, another great option just a couple of minutes away. 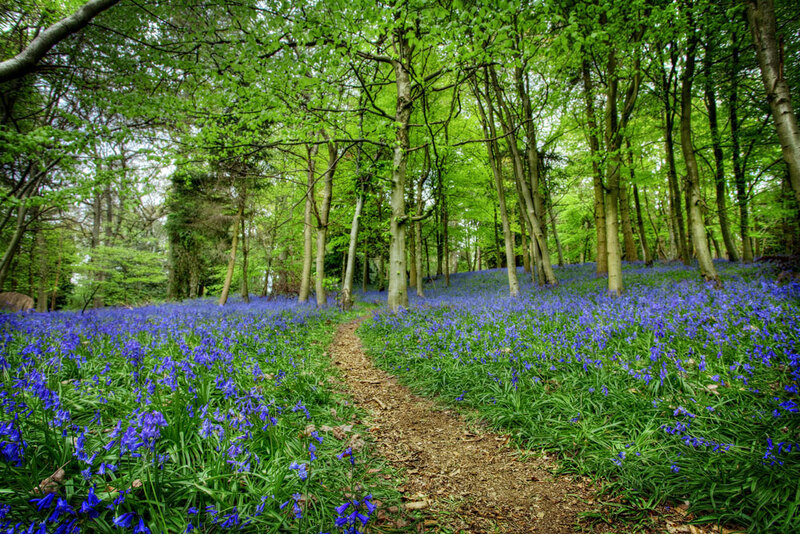 A one-mile walk to the historic arboretum, through a conifer avenue and into Frank’s Wood, is where you’ll find these blue wonders at Leith Hill. You’ll most likely see little clusters along the roadside as you drive there too. Pitstop: The Plough Inn in Coldharbour, at the base of Leith Hill, is a lovely country pub serving artisan beer from its own microbrewery and fabulous food. There are also boutique bedrooms if you fancy a cheeky overnighter. There’s a beautiful bluebell walk here, with an abundance of the tiny blue flowers carpeting the woodland. Here’s a link to a great circular walking trail that will take you past some wonderful displays through woodlands and open parkland. There’s a children’s adventure playground along the way, and the trail is great for dog walkers. Pitstop: The Queen’s Head in Clandon is the nearest, and a brilliant option – or a few minutes further on you’ll find The Onslow Arms, another great Surrey pub. From late April a carpet of bluebells covers the floor at Winkworth Arboretum, near Godalming, perfuming the woodland air, thriving in the dappled sunlight of the coppiced areas. Pitstop: The White Horse in Hascombe is a superb country pub with a great choice of drinks, fabulous food and a wonderful garden. Another great option, and one with rooms if you fancied an overnight stay, is the Stag on the River, in Lower Easing, just 10 minutes away in the car. Bluebells thrive in this typical example of a hazel coppice woodland on Weald Clay. There’s a woodland stream running through the site, which also has a small pool and is surrounded by pasture. Pitstop: There’s no parking at Walls Wood, but The Scarlett Arms in the village are happy for visitors to use theirs. A mosaic of ancient and recent woodlands, scrubs and open grassland on chalk. Look out for bluebells in the woodland of beech, ash and field maple and also stunning displays of cowslips in the meadows. Pitstop: The Duke of Wellington in East Horsley or The Queen’s Head in Clandon. In the north-west corner of these woodlands you’ll find the smaller Little Earls Wood which is famed for a fantastic display of bluebells in the spring. Pitstop: The Bull Inn, in Limpsfield is divine.